* Newly available with the ecologically friendly feature, "Scrap Free" Mechanism !! 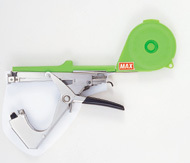 ­ "Scrap Free" mechanism prevents making tape-scraps during work. * The growers choice since 1968 !